The seller of today’s Nice Price or Crack Pipe Impreza says there’s 10K on all its WRX-sourced parts. That should prove enough for a shakedown run, but let’s hope its price isn’t a shakedown of another kind. In that case of yesterday’s 2017 Alfa Romeo Giulia 2.0 and its seeming half-off $22,950 price, both scenarios may apply. That’s dirt cheap for a model that’s still on the market new, but raises questions as to why it is so. That played into the voting, but in the end price won out and the Giulia took home a solid 65 percent Nice Price win. The list of AWD performance wagons is a short one. Hell, here in the States it’s getting shorter by the year. Audi has pretty much given up on them here, preferring to apply their longroof performance bonafides to crossovers. BMW won’t sell any version of the new 3-series wagon here, and Mercedes, well, yeah. Even Subaru, long the purveyor of AWD wagons and performance engines alike has most recently taken a hands off approach to the category. That’s why some Subaru owners take matters into their own hands. Witness as a result this 2002 Subaru Impreza Outback Sport. Imbued with underpinnings from its hot WRX cousin, this little wagon is a car that Subaru never sold here, but probably should have. As noted, this car started out as an Outback Sport, a U.S.-only model. That carried a 165 horsepower 2.5-litre flat four and a slightly jaunty ride height. The WRX offered up a turbocharged and intercooled 2-litre that was good for 227 horses and stuck to the pavement. This car mods that into one WRX where the W could very well stand for Wild Wagon. That’s because you don’t just get 227 horses here. The seller notes that he’s modded the engine extensively, starting by stroking it out to a slightly bumped 2.1 litres. On top of that it has a litany of upgrades including an STi 2.5 crank, upgraded turbo, and aftermarket almost everything else. And, in case you’re wondering about the whole thing holding on to its heads, the mill has ARP L19 headstuds holding them down. It also has 10K on the build which should make any problems evident by now. The ad claims the ECU has been tuned for 93 pump octane which gives the car 410 horsepower at the wheels. An e85 tune is incomplete but is claimed to eventually do that and 50 more. Everything else on the car has been WRX-ized in support, from the resealed gearbox to the JDM front seats. Around this is an Outback Sport body that’s said to have come from Florida. That means it might be crazy but is also rust-free. The builder avers that he’s even rust-proofed the parts that might corrode now that it calls Boston its home. The car looks to be in great shape up top. The Savanna Green/Greystone Metallic paint looks to be in serviceable shape, and the car is rolling on aftermarket 17-inch wheels. Those are bolted to modded suspension bits through a set of spacers which stick them out to the edges of the arches. Ride height looks low, but not “I can’t go there because there’s railroad tracks” low. The interior is claimed to be a WRX transplant with front seats out of a JDM WRX and a gauge cluster out of a Saaburu. Everything looks tidy even if it’s a bit of a Frankencar in here. Hell, on reflection, the whole thing is a Frankencar. Regardless of that, it all seems to have been pulled together nicely. There’s 186K on the car and, as noted earlier, 10K on the build. Those miles might make you think everything bad from the build has been fully addressed by now. Alternatively, you could be thinking that’s about the right miles for this heavily taxed motor to go all grenade-like on its new owner. Either way, the asking price is $15,000 which gets you a clear title and a muddied heritage. Still, this is a car that a lot of people will appreciate for its audacity and likely its get up and go. For $15,000, do you think we could count you among them? H/T to Ryan Morash for the hookup! 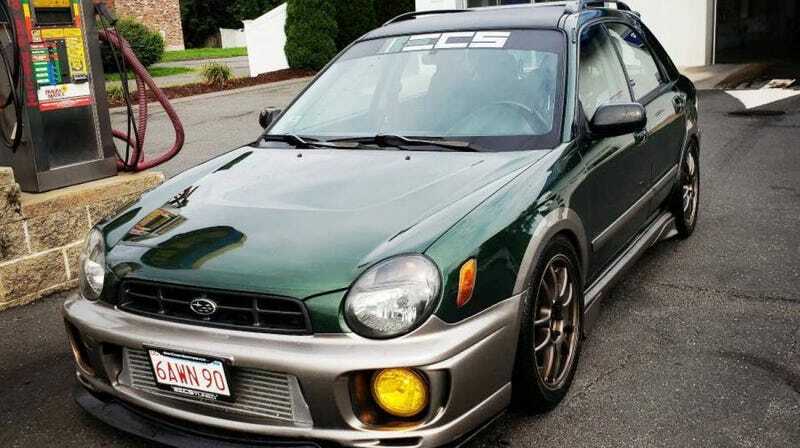 Would You Pay $5,500 For A 300K 2000 Subaru Impreza 2.5 RS? Well, Now You Can!